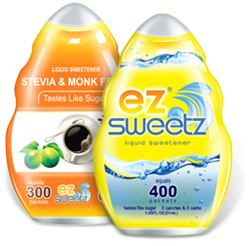 EZ-Sweetz® is a liquid sweetener made from Sucralose, which is the same sweetener as in Splenda® packets. In brief: EZ-Sweetz® is a liquid sweetener compared to the Splenda® and other similar Sucralose packets. The difference between EZ-Sweetz® and Sucralose packets is that EZ-Sweetz® has no filler so it costs substantially less. The Sucralose packets are filled with 99% of bulking materials, such as Maltodextrin and Dextrose, which have no nutritional value but add calories and carbs, so they cost much more to the consumers. EZ-Sweetz® is specially formulated by a patented and proprietary technology and offers many advantages over the traditional sweetener packets to support today’s healthy lifestyle.